Dollar Tree Value Seeks Club: Score Exclusive Offers, Tips, Product Sneak Peeks and More! If you shop at Dollar Tree, make sure you join the Dollar Tree Value Seekers Club. You’ll get access to members-only contests, money-saving party ideas, crafts, recipes, exclusive product sneak peeks & more! I love Dollar Tree. They have so many items for you score for FREE with coupons! Kellogg’s Pop-Tarts Only $0.33 at Dollar Tree! Head to Dollar Tree to score Kellogg’s Pop-Tarts for only $0.33! Final Price: $1.00 – that’s only $0.33 each! Head to Dollar Tree and score Del Monte Fruit Refeshers 2 pk for FREE! Have you stopped by Dollar Tree lately? They have a ton of great items for Valentine’s Day. And all for a $1, it’s a great deal! Whether you are looking to buy for your kid’s class or get a sweet surprise for that special someone, you will be sure to find something there! I buy all of my gift bags from Dollar Tree. They have a great a great selection, especially for holidays. This is a great deal! They have a huge selection, any kid will be able to find a set they love. How cute is this bag? I’m always on the lookout for a good reusable bag. Kids will have fun making their own mailbox and then showing it off in class. I’ll admit… I almost bought this for myself! Bright, fun, and already made! My daughter and her friends loved these! They will be a hit in any Valentine gift. These have adorable dogs with sayings on them. So cute. Dress up your Valentine’s Day outfit with one of these bright scarves. The cards are 2 for $1! I don’t buy cards anywhere else, considering most places charge $3-5 for one card! Those are the great Valentine’s Day items I found at Dollar Tree! Have you found any other great Valentine’s gifts at Dollar Tree? Head to Dollar Tree tomorrow and save 10% off your entire purchase of $10.00 or more. You’ll need to print the coupon found here. Limit one voucher per customer and it can be used in-store only. One of my favorite places to shop for Christmas party supplies is Dollar Tree. The price is just right (every item is only $1.00) and there is always a great variety of supplies to choose from. You can’t beat their selection of Christmas paper, gift bags, and Christmas cards. I don’t buy my supplies anywhere else. 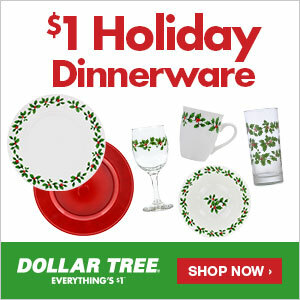 This year, I’m hosting Christmas at my house, so I’ll be picking up my party supplies at Dollar Tree too. I plan on decking out my party table with these Gold Plastic Charger Plates with Beaded Rims and Perception Red Wine Glasses. They’ll look so cute on the table and at only a $1.00 each they are so affordable. Don’t you think these table top Christmas trees will make the perfect center piece! After I add some tinsel and a few decorations they will be adorable. Make sure you check out Christmas at the Tree to see the huge variety of Christmas items they carry. You’ll find Christmas decor, ornaments, Christmas floral and crafts, stocking stuffers for everyone on your list, wrapping paper and bags, bows, Christmas cards, holiday dinnerware and more! Head to Dollar Tree today and save 10% on your entire purchase of $10.00 or more. You’ll need to print the coupon found here. Limit one voucher per customer and it can be used in-store only.